The Danish customer experience management firm Sitecore has been awarded the Transatlantic Company of the Year 2016 by the American Chamber of Commerce in Denmark. 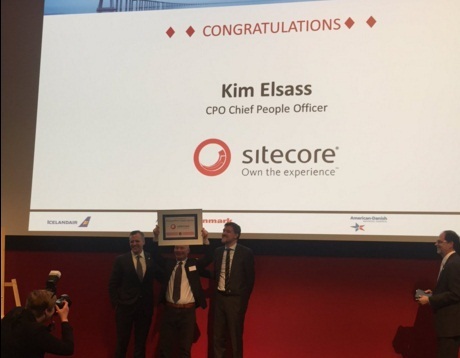 Sitecore, which is based in Denmark and the US, won the award thanks to impressive growth that has catapulted it into becoming a global leader within its field. “It is a sign that our global vision and visionary approach is a good recipe to grow and remain successful,” said Kim Elsass, the chief people officer at Sitecore. The US ambassador to Denmark, Rufus Gifford, was at hand to hand over the prize to Sitecore in connection with AmCham’s annual meeting at Lundbeck’s headquarters in Valby yesterday. AmCham praised Sitecore for surpassing 1 billion kroner in turnover – half of which stems from the US, where the company has established three offices and employs 250 people. The ‘Transatlantic Company of the Year’ prize is handed out every year by Amcham to Danish companies engaged in the US. The other finalists this year were GN Store Nord and Siteimprove. Previous winners include Gehl Architects (2015), Lundbeck (2014), Terma (2013), Novozymes (2012), Grundfos (2011) and Novo Nordisk (2010).